The foggy clouds, insecure by the incessant talks about them everywhere, conspired to make their presence felt with their overwhelming presence, delaying the flights of the speakers who had boarded the flight to atend “Cloud Computing Summit” on 26th November at Novotel Hyderabad. The organizers, however undeterred by the clouds, shuffled the slots and organized the conference without any hitch. I understand the business aspects of cloud computing and I have been quite passionately following the developments in this sector. Please feel free to correct if I have mispelt any of the technical stuff which I attempt to write in this. The conference began on a solemn note with Rajdeep Dua, Country Head-Lead Developer Relations, Google, presenting on the Google App Engine offerings. He elaborated about the PaaS offering, with its autoscaling and other features, along with support offered to both Python and Web Java languages. He also presented Google Storage and Google Big Query features. Big Query has the ability to run sequalized queries over peta bytes of data. Google storage offers 100 GBs of data storage space, as compared to Amazon’s 5 GB of storage space offering. He also talked at length about Google Prediction API, with its use cases ranging from Web Trends detection, finding spam etc. Some of the offerings that were showcased, he pointed out, had limited preview, restricted to US alone. I was eager to experience the Googliness in the presentation. However, it turned out to be business as usual, technical presentation, albeit with Google’s simplicity. The summit then got its most needed energy and pizzazz when Laxmi Narayan Rao, Marketing Director, Global Channel Program, Jam Cracker enlivened the proceedings as the Chairperson of the morning sessions, with full spirits. 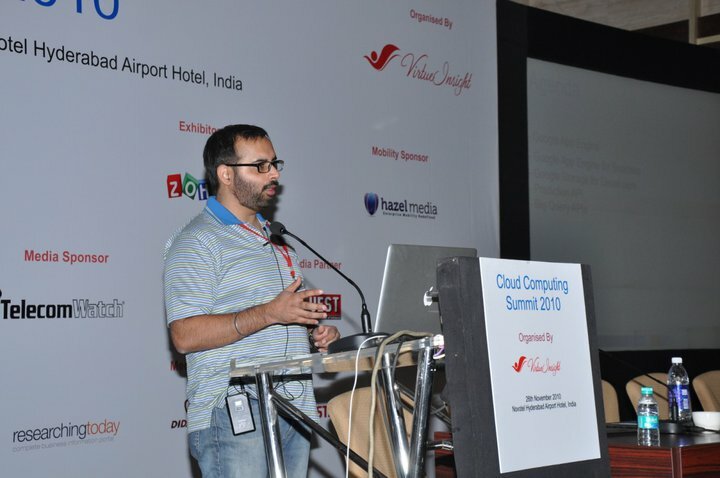 He threw some interesting facts on the present scenario in Cloud computing. Cloud computing found its unlikely support through governments, when Madhya Pradesh lent its computing servers to Jammu and Kashmir. He gave some interesting observations on usage of Facebook as a CRM tool. He also pointed out, something that would interest people willing to embark their careers, that the Top 10 hottest jobs of 2009, were non-existent five years ago. 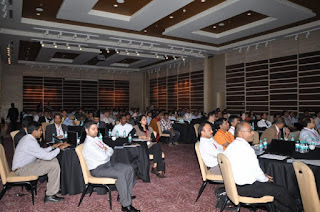 Shyaam Sunder, Chief Knowledge Officer, Ramco Systems, presented his session on ERP Cloud offerings. He talked passionately about the future potential of the Cloud. He started out with the ubiquity of networks around our lives and talked about how Governments across the world are beginning to adopt towards Cloud computing to reduce costs of computing. California’s Government’s initiatives to bring in Cloud computing in their day-to-day transactions were also mentioned. He highlighted the egalitarian nature of the Cloud, which offers everyone an unprecedented opportunity to build their own application without worrying about capital costs. Laxmi Narayan Rao chipped in and mentioned about The Roar of the Cloud Challenge, in its FB page’s words, an ambitious Cloud Applications industry initiative led by WOLF Frameworks and Jamcracker, powered by One Billion Minds to discover and support the best next generation SaaS application ideas in India. Shyaam Sunder talked about how ERP on demand brought about a new lease of life to the Indian ERP Market, which was once considered doomed in the early 2000s by several experts. He focussed on the timecriticality aspect and multitenancy behavoior in Cloud computing, very crucial in the case of ERP on Demand. He lucidly brought out the shift that has happened from time-dependency to time-criticality. He also talked about the evolution of Cloud computing and how cloud computing emerged, in its inchoate state, picking up several technologies, notably from SOA Architecture. He illustrated the use of ERP systems through one of his clients, ITC IBD – International Business Division. I personally liked one of his candid observations about the role of IT in business. He said, IT can do only two things. It can process voluminous data and connect people. He also highlighted on the security aspects, one of the most devious issues when it comes to Cloud computing Adoption in India, and highlighted Ramco ERP System’s SAS Type II certification. He also pointed out that the major challenge often lies in metadata conceptualization. As Cloud Computing is growing leaps and bounds, as it is evolving itself to adapt towards the Indian Market, he talked about ensuing research happening in this front. He mentioned the audience to check out few research papers. Earlier during the day, before the conference began, I had a chance to chat up with Kiran Sharma, Cloud Solutions Specialist at eVapt, an emerging Cloud Billing & Revenue management Solutions provider. 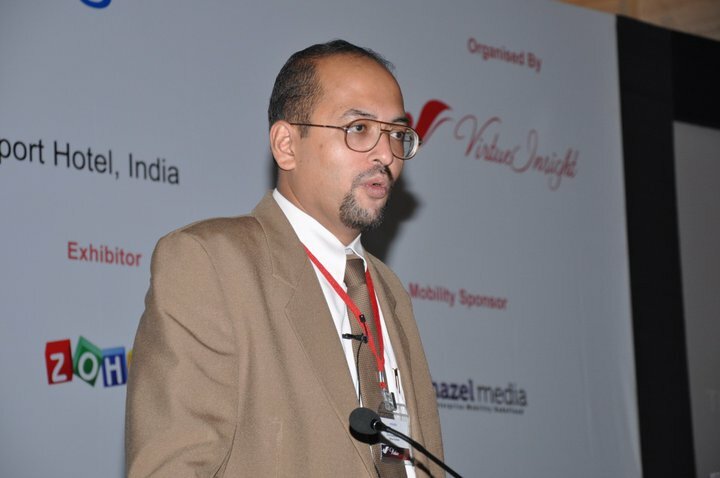 Kiran has been instrumental in conceptualizing this summit along with the event partners, VirtueInsight. When I asked him about his motivation to organize an event of this scale, he shared his interest to improve Cloud adoption rate in India and felt that an event of this kind would help in addressing the challenges that were involved in the widespread adoption in the robust Indian IT market, built on the on-premises delivery model. He also agreed that as the delivery model itself is undergoing a change, it is not surprising to see the reluctance in shifting as it involves an entire shift in the architecture. He further added that although several IT players have been bringing out several services over to the Cloud, their rate of adoption surprisingly has been quite low. He laments that the IT players are only talking about IT solutions and are not talking openly about adopting SaaS solutions. I ask him about the popular frameworks that have been used profusely in the industry. He pointed towards few solutions available in the world where you can build your business component on top of it. He predicts that within two years, we can expect the entire ecosystem would move over to the Cloud. I quiz him about eVapt to learn more about it. He explains about how his firm sits at the center of ecosystem, interacting with all the back office solutions, thus providing functions such as Contract managament, Usage metering, Rating, Billing. Revenue settlement & Partner management et al. The discussion veers towards his home city Hyderabad and the extensive cloud ecosystem built at Hyderabad. He asserts his strong sense of pride over the Nawab city and tells me that he has been inspired by Bangalore which has been forerunner in organizing several tech events.